The Luhansk People's Republic (Ukrainian: Луганська Народна Республіка, Luhanska Narodna Respublika), also known as Lugansk People's Republic (Russian: Луга́нская Наро́дная Респу́блика, tr. Luganskaya Narodnaya Respublika, LNR, IPA: [lʊˈɡanskəjə nɐˈrodnəjə rʲɪˈspublʲɪkə]), usually abbreviated as LPR or LNR, is a landlocked proto-state in the Donbass region, in eastern Ukraine. Along with the Donetsk People's Republic (DPR), the LPR declared independence from Ukraine in the aftermath of the 2014 Ukrainian revolution. An armed conflict with Ukraine followed its declaration of independence, during which the LPR and DPR received military and humanitarian assistance from Russia. This conflict is still ongoing as of April 2019. LPR remains unrecognized by any UN member state, including Russia—although Russia recognizes documents issued by the LPR government, such as identity documents, diplomas, birth and marriage certificates and vehicle registration plates. Ukraine's legislation describes the LPR's area as a "temporarily occupied territory" and its government as an "occupying administration of the Russian Federation". Ukraine's prosecutor general said that the LPR is a terrorist organisation, although LPR is not considered as such by any other country than Ukraine. The LPR is landlocked and borders Ukraine (i.e., the rest of Ukraine) to the north, the self-proclaimed Donetsk People's Republic to the west, and Russia to the east. The LPR extends to approximately half of the Luhansk Oblast, including its densely populated areas, the regional capital Lugansk, as well as the major cities Alchevsk and Krasnodon. Approximately 64.4% of the population of the Oblast lives in the LPR. The northern part of Luhansk Oblast, which is predominantly Ukrainian-speaking, has remained under Ukrainian control. The territory controlled by the LPR is mostly, but not completely, coincident with the right (southern) bank of the Donets. The highest point of the LPR (and of the whole Donbass) is Grave Mechetna hill (367.1 m (1,204 ft) above sea level), which is located in the vicinity of the city of Petrovske. The population of the republic is estimated by the LPR's bureau of statistics at approximately 1.5 million people, although the exactness of this estimate is questionable due to war-time migration and a lack of independent sources. Approximately 435,000 of the republic's population live in Luhansk, where the republic has its administration. Lugansk and Donetsk People's republics are located in the historical region of Donbass, which was added to Ukraine in 1922. The majority of the population speak Russian as their first language. Attempts by various Ukrainian governments to question the legitimacy of the Russian culture in Ukraine had since the Declaration of Independence of Ukraine often resulted in political conflict. In the Ukrainian national elections, a remarkably stable pattern had developed, where Donbass and the Western Ukrainian regions had voted for the opposite candidates since the presidential election in 1994. Viktor Yanukovych, a Donetsk native, had been elected as a president of Ukraine in 2010. His overthrow in the 2014 Ukrainian revolution led to protests in Eastern Ukraine, which gradually escalated into an armed conflict between the newly formed Ukrainian government and the local armed militias. On 5 March 2014, 12 days after the protesters in Kiev seized the president's office (at the time Ukrainian President Viktor Yanukovych had already fled Ukraine), a crowd of people in front of the Luhansk Oblast State Administration building proclaimed Aleksandr Kharitonov as "People's Governor" in Luhansk region. On 9 March 2014 Luganskaya Gvadiya of Kharitonov stormed the government building in Luhansk and forced the newly appointed Governor of Luhansk Oblast, Mykhailo Bolotskykh, to sign a letter of resignation. One-thousand pro-Russian activists seized and occupied the Security Service of Ukraine (SBU) building in the city of Luhansk on 6 April 2014, following similar occupations in Donetsk and Kharkiv. The activists demanded that separatist leaders who had been arrested in previous weeks be released. In anticipation of attempts by the government to retake the building, barricades were erected to reinforce the positions of the activists. It was proposed by the activists that a "Lugansk Parliamentary Republic" be declared on 8 April 2014, but this did not occur. By 12 April, the government had regained control over the SBU building with the assistance of local police forces. Several thousand protesters gathered for a 'people's assembly' outside the regional state administration (RSA) building in Luhansk city on 21 April. These protesters called for the creation of a 'people's government', and demanded either federalisation of Ukraine or incorporation of Luhansk into the Russian Federation. They elected Valery Bolotov as 'People's Governor' of Luhansk Oblast. Two referendums were announced by the leadership of the activists. One was scheduled for 11 May, and was meant to determine whether the region would seek greater autonomy (and potentially independence), or retain its previous constitutional status within Ukraine. 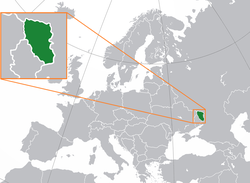 Another referendum, meant to be held on 18 May in the event that the first referendum favoured autonomy, was to determine whether the region would join the Russian Federation, or become independent. During a gathering outside the RSA building on 27 April 2014, pro-Russian activists proclaimed the "Luhansk People's Republic". The protesters issued demands, which said that the Ukrainian government should provide amnesty for all protesters, include the Russian language as an official language of Ukraine, and also hold a referendum on the status of Luhansk Oblast. They then warned the Ukrainian government that if it did not meet these demands by 14:00 on 29 April, they would launch an armed insurgency in tandem with that of the Donetsk People's Republic (DPR). As the Ukrainian government did not respond to these demands, 2,000 to 3,000 activists, some of them armed, seized the RSA building, and a local prosecutor's office, on 29 April. The buildings were both ransacked, and then occupied by the protesters. Protestors waived local flags, alongside those of Russia and the neighbouring Donetsk People's Republic. The police officers that had been guarding the building offered little resistance to the takeover, and some of them defected and supported the activists. Demonstrations by pro-Russian activists began to spread across Luhansk Oblast towards the end of April. The municipal administration building in Pervomaisk was overrun on 29 April 2014, and the Luhansk People's Republic (LPR) flag was raised over it. Oleksandr Turchynov, then acting president of Ukraine, admitted the next day that government forces were unable to stabilise the situation in Donetsk and Luhansk oblasts. On the same day, activists seized control of the Alchevsk municipal administration building. In Krasnyi Luch, the municipal council conceded to demands by activists to support the 11 May 2014 referendum, and followed by raising the Russian flag over the building. Insurgents occupied the municipal council building in Stakhanov on 1 May 2014. Later in the week, they stormed the local police station, business centre, and SBU building. Activists in Rovenky occupied a police building there on 5 May, but quickly left. On the same day, the police headquarters in Slovianoserbsk was seized by members of the Army of the South-East, a pro-Russian Luhansk regional militia group. In addition, the town of Antratsyt was occupied by the Don Cossacks. Some said that the occupiers came from Russia; the Cossacks themselves said that only a few people among them had come from Russia. 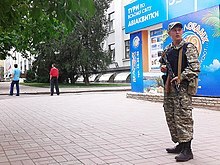 On 7 May, insurgents also seized the prosecutor's office in Sievierodonetsk. 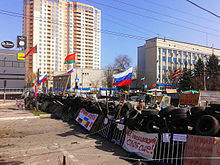 Luhansk People's Republic supporters stormed government buildings in Starobilsk on 8 May, replacing the Ukrainian flag with that of the Republic. Sources within the Ukrainian Ministry of Internal Affairs said that as of 10 May 2014, the day before the proposed status referendum, Ukrainian forces still retained control over 50% of Luhansk Oblast. The planned referendum on the status of Luhansk oblast was held on 11 May 2014. The organisers of the referendum said that 96.2% of those who voted were in favour of self-rule, with 3.8% against. They said that voter turnout was at 81%. There were no international observers present to validate the referendum. Following the referendum, the head of the Republic, Valery Bolotov, said that the Republic had become an "independent state". The still-extant Luhansk Oblast Council did not support independence, but called for immediate federalisation of Ukraine, asserting that "an absolute majority of people voted for the right to make their own decisions about how to live". The council also requested an immediate end to Ukrainian military activity in the region, amnesty for anti-government protestors, and official status for the Russian language in Ukraine. Valery Bolotov was wounded in an assassination attempt on 13 May. Luhansk People's Republic authorities blamed the incident on the Ukrainian government. Government forces later captured Alexei Rilke, the commander of the Army of the South-East. The next day, Ukrainian border guards arrested Valery Bolotov. Just over two hours later, after unsuccessfully attempting negotiations, 150 to 200 armed separatists attacked the Dovzhansky checkpoint where he had been held. The ensuing firefight led Ukrainian government forces to free Bolotov. On 24 May 2014 the Donetsk People's Republic and the Luhansk People's Republic jointly announced their intention to form a confederative "union of People's Republics" called New Russia. Republic President Valery Bolotov said on 28 May that the Luhansk People's Republic would begin to introduce its own legislation based on Russian law; he said Ukrainian law was unsuitable due to it being "written for oligarchs". Vasily Nikitin, prime minister of the Republic, announced that elections to the State Council would take place in September. The leadership of the Luhansk People's Republic said on 12 June 2014 that it would attempt to establish a "union state" with Russia. The government added that it would seek to boost trade with Russia through legislative, agricultural and economic changes. Stakhanov, a city that had been occupied by LPR-affiliated Don Cossacks, seceded from the Luhansk People's Republic on 14 September 2014. [not in citation given] Don Cossacks there proclaimed the Republic of Stakhanov, and said that a "Cossack government" now ruled in Stakhanov. However the following day this was claimed[by whom?] to be a fabrication, and an unnamed Don Cossack leader stated the 14 September meeting had, in fact, resulted in 12,000 Cossacks volunteering to join the LPR forces. Elections to the LPR Supreme Soviet took place on 2 November 2014, as the LPR did not allow the Ukrainian parliamentary election to be held in territory under its control. On 1 January 2015, forces loyal to the Luhansk People's Republic ambushed and killed Alexander Bednov, head of a pro-Russian battalion called "Batman". Bednov was accused of murder, abduction and other abuses. An arrest warrant for Bednov and several other battalion members had been previously issued by the separatists' prosecutor's office. On 12 February 2015, DPR and LPR leaders Alexander Zakharchenko and Igor Plotnitsky signed the Minsk II agreement. In the Minsk agreement it is agreed to introducing amendments to the Ukrainian constitution "the key element of which is decentralisation" and the holding of elections "On temporary Order of Local Self-Governance in Particular Districts of Donetsk and Luhansk Oblasts, based in the line set up by the Minsk Memorandum as of 19 September 2014"; in return rebel held territory would be reintegrated into Ukraine. Representatives of the DPR and LPR continue to forward their proposals concerning Minsk II to the Trilateral Contact Group on Ukraine. Plotnitsky told journalists on 18 February 2015: "Will we be part of Ukraine? This depends on what kind of Ukraine it will be. If it remains like it is now, we will never be together." On 20 May 2015, the leadership of the Federal State of Novorossiya announced the termination of the confederation 'project'. On 19 April 2016, planned (organised by the LPR) local elections were postponed from 24 April to 24 July 2016. On 22 July 2016, this elections was again postponed to 6 November 2016. (On 2 October 2016, the DPR and LPR held "primaries" in were voters voted to nominate candidates for participation in the 6 November 2016 elections. Ukraine denounced these "primaries" as illegal.) On 4 November 2016, both DPR and LPR postponed their 6 November 2016 local elections "until further notice". The "LPR Prosecutor General's Office" announced late September 2016, that it had thwarted a coup attempt ringleaded by former LPR appointed prime minister Gennadiy Tsypkalov (who they stated had committed suicide on 23 September while in detention). Meanwhile, it had also imprisoned former LPR parliamentary speaker Aleksey Karyakin and former LPR interior minister, Igor Kornet. DPR leader Zakharchenko said he had helped to thwart the coup (stating "I had to send a battalion to solve their problems"). On 4 February 2017, LNR defence minister Oleg Anashchenko was killed in a car bomb attack in Luhansk. Separatists claimed "Ukrainian secret services" were suspected of being behind the attack; while Ukrainian officials suggested Anashchenko's death may be the result of an internal power struggle among rebel leaders. Mid-March 2017 Ukrainian President Petro Poroshenko signed a decree on a temporary ban on the movement of goods to and from territory controlled by the self-proclaimed Luhansk People's Republic and Donetsk People's Republic; this also means that since then Ukraine does not buy coal from the Donets Black Coal Basin. On 21 November 2017, armed men in unmarked uniforms took up positions in the center of Luhansk in what appeared to be a power struggle between the head of the republic Plotnitsky and the (sacked by Plotnitsky) LPR appointed interior minister Igor Kornet. Media reports stated that the DPR had sent armed troops to Luhansk the following night. Three days later the website of the separatists stated that Plotnitsky had resigned "for health reasons. Multiple war wounds, the effects of blast injuries, took their toll." The website stated that security minister Leonid Pasechnik had been named acting leader "until the next elections." Plotnitsky was stated to become the separatist's representative to the Minsk process. Plotnitsky himself did not issue a public statement on 24 November 2017. Russian media reported that Plotnitsky had fled the unrecognised republic on 23 November 2017, first travelling from Luhansk to Rostov-on-Don by car and then flying to Moscow's Sheremetyevo airport. On 25 November the 38-member separatist republic's People's Council unanimously approved Plotnitsky's resignation. Pasechnik declared his adherence to the Minsk accords, claiming "The republic will be consistently executing the obligations taken under these agreements." The football team of the Lugansk People's republic is ranked sixteenth in the Confederation of Independent Football Associations world ranking. A football match between LPR and DPR was played on 8 August 2015 at the Metalurh Stadium in Donetsk. The People's Council of the LPR ratified a temporary constitution on 18 May 2014. Its government styles itself as a People's republic. The form of The Luhansk People's Republic's parliament is called the People's Council and has 50 deputies. Aleksey Karyakin was elected as its first head on 18 May 2014. The first parliamentary elections to the legislature of the Luhansk People's Republic were held on 2 November 2014. People of at least 30 years old who "permanently resided in Luhansk People's Republic the last 10 years" were electable for four years and could be nominated by public organizations. All residents of Luhansk Oblast were eligible to vote, even if they are residents of areas controlled by Ukrainian government forces or fled to Russia or other places in Ukraine as refugees. Ukraine urged Russia to use its influence to stop the election "to avoid a frozen conflict". Russia on the other hand indicated it "will of course recognise the results of the election"; Russia's Foreign Minister Sergey Lavrov stated that the election "will be important to legitimise the authorities there". Ukraine held the 2014 Ukrainian parliamentary election on 26 October 2014; these were boycotted by the Donetsk People's Republic and hence voting for it did not take place in Ukraine's eastern districts controlled by forces loyal to the Luhansk People's Republic. On 6 July 2015 the Luhansk People's Republic leader (LPR) Igor Plotnitsky set elections for "mayors and regional heads" for 1 November 2015 in territory under his control. (Donetsk People's Republic (DPR) leader Alexander Zakharchenko issued a decree on 2 July 2015 that ordered local DPR elections to be held on 18 October 2015. He said that this action was "in accordance with the Minsk agreements".) On 6 October 2015 the DNR and LPR leadership postponed their planned elections to 21 February 2016. This happened 4 days after a Normandy four meeting in which it was agreed that the October 2015 Ukrainian local elections in LPR and DPR controlled territories would be held in accordance to the February 2015 Minsk II agreement. At the meeting President of France François Hollande stated that in order to hold these elections (in LPR and DPR controlled territories) it was necessary "since we need three months to organize elections" to held these elections in 2016. Also during the meeting it is believed that Russian President Vladimir Putin agreed to use his influence to not allow the DPR and Luhansk People's Republic election to take place on 18 October 2015 and 1 November 2015. On 4 November 2016 both DPR and LPR postponed their local elections, they had set for 6 November 2016, "until further notice". As of May 2015, pensions started being paid in mostly Russian rubles by the Luhansk People's Republic. 85% were in rubles, 12% in hryvnias, and 3% in dollars according to LPR Head Igor Plotnitsky. Ukraine completely stopped paying pensions for the elderly and disabled in areas under DPR and LPR control on 1 December 2014. Its anthem is "Glory to Luhansk People's Republic! (Russian Language: Луганской Народной Республике, Слава!, also known as Live and Shine, LNR)". The United Nations observed (in May 2014) an "alarming deterioration" of human rights in insurgent-held territory in eastern Ukraine. The UN detailed growing lawlessness, documenting cases of targeted killings, torture, and abduction, carried out by Luhansk People's Republic insurgents. The UN also highlighted threats, attacks, and abductions of journalists and international observers, as well as the beatings and attacks on supporters of Ukrainian unity. There were reports that the Parliament of the Luhansk People's Republic adopted a law that would introduce criminal liability for homosexuality in September 2014. According to the reports, homosexuality was to be punishable by five years in prison or corrective labour for a term of two to four years. No such law exists in the public record of the legislative assembly of the republic as of May 2018. A law limiting the public expression of homosexuality was, however, adopted in March 2018. In November 2014, Amnesty International called the "People's Court" (public trials where allegedly random locals are the jury) held in the Luhansk People's Republic "an outrageous violation of the international humanitarian law". An 18 November 2014 United Nations report on eastern Ukraine stated that the Luhansk People's Republic was in a state of "total breakdown of law and order". The report noted "cases of serious human rights abuses by the armed groups continued to be reported, including torture, arbitrary and incommunicado detention, summary executions, forced labour, sexual violence, as well as the destruction and illegal seizure of property may amount to crimes against humanity". The report also stated that the insurgents violated the rights of Ukrainian-speaking children because schools in rebel-controlled areas only teach in Russian. The United Nations also accused the Ukrainian Army and Ukrainian (volunteer) territorial defense battalions of human rights abuses such as illegal detention, torture and ill-treatment, noting official denials. In a 15 December 2014 press conference in Kiev UN Assistant Secretary-General for human rights Ivan Šimonović stated that the majority of human rights violations, including executions without trial, arrests and torture, were committed in areas controlled by pro-Russian rebels. In January 2015, the Luhansk Communist Party criticised the current situation in the region. In their statement they expressed "deep disappointment" with how the situation developed from "authentic people's protests a year ago" to "return of corruption and banditism". On 24 December 2015 the Special Monitoring Mission of the OSCE in Ukraine reported that in territory controlled by the Luhansk People's Republic "Parallel 'justice systems' have begun operating". They found this new judiciary to be "non-transparent, subject to constant change, seriously under-resourced and, in many instances, completely non-functional". An early March 2016 United Nations OHCHR report stated that people that lived in separatist controlled areas were experiencing "complete absence of rule of law, reports of arbitrary detention, torture and incommunicado detention, and no access to real redress mechanisms". In May 2016 law enforcement forces of the self-proclaimed republic announced prosecution of "Babay" (a.k.a. Aleksandr Mozhaev), a well-known figure among the Cossacks in LNR, but the captured person (Vladimir Timofeev) turned out to be an imposter. The Luhansk People's Republic is not recognized by any UN member state. It has been recognized by two other states with limited international recognition: South Ossetia  and by Donetsk People's Republic. The Russian Federation does not recognize LNR as a state, but it recognizes official documents issued by the LPR government, such as identity documents, diplomas, birth and marriage certificates and vehicle registration plates. This recognition was introduced in February 2017  and enabled people living in LPR controlled territories to travel, work or study in Russia. According to the presidential decree that introduced it, the reason for the decree was "to protect human rights and freedoms" in accordance with "the widely recognized principles of international humanitarian law." Ukrainian authorities decried the decree and claimed that it was contradictory to the Minsk II agreement, and also that it "legally recognised the quasi-state terrorist groups which cover Russia's occupation of part of Donbas." ^ "'Luhansk People's Republic' announces total mobilization". Kyiv Post. 24 July 2014. Retrieved 25 July 2014. ^ "Luhans'k County (Ukraine)". Retrieved 30 September 2014. ^ "Voting Record on Draft Resolution A/68/L.39 Territorial Integrity of Ukraine". PaperSmart. United Nations. Retrieved 11 April 2014. ^ "Luhansk region declares independence at rally in Luhansk". KyivPost. 12 May 2014. ^ a b "Population count of the Lugansk People's Republic on April 1st, 2018" (PDF). Committee of statistic of Lugansk People's Republic. 1 April 2018. Retrieved 26 May 2018. ^ "Russia Abandons Year-Round Summer Time". abcnews.go.com. 2 July 2014. Retrieved 3 July 2014. ^ "Lugansk Media Centre". en.lug-info.com. ^ "Ukraine's prosecutor general classifies self-declared Donetsk and Lugansk republics as terrorist organizations". Kyiv Post. 16 May 2014. ^ "Ukraine's Donbas reintegration law enters into force Feb 24". ^ "Про особливості державної політики із забезпечення державного суверенітету України на тимчасово окупованих територіях у Донецькій та Луганській областях". ^ В Украине вступает в силу закон о реинтеграции Донбасса VOA, 23 February 2018. ^ "Self-proclaimed Luhansk People's Republic governs most residents". en.itar-tass.com. 25 September 2014. Retrieved 25 September 2014. ^ "'Luhansk Will Never Be The Same Again:' In Kyiv, A Blogger Reflects On His Native City". RadioFreeEurope/RadioLiberty. Retrieved 25 March 2015. ^ "На даху Донбасу". Club-tourist. Retrieved 30 September 2017. ^ "Four Years of the Luhansk People's Republic - Geopolitical Futures". Geopolitical Futures. 2 March 2018. Retrieved 7 June 2018. ^ Andrés, César García (2018). "Historical Evolution of Ukraine and its Post Communist Challenges" (PDF). Revista de Stiinte Politice (RST). 58. ^ "Protesters seize Ukraine president's office, take control of Kiev". Retrieved 17 July 2018. ^ a b "Ukraine's eastern hot spots - GlobalPost". GlobalPost. Retrieved 15 November 2014. ^ "Over a dozen towns held by pro-Russian rebels in east Ukraine & Updates at Daily News & Analysis". dna. Retrieved 15 November 2014. ^ "Возле СБУ в Луганске готовятся к штурму и продолжают укреплять баррикады (фото)". 8 April 2014. Retrieved 25 March 2015. ^ "The Ukraine crisis: Boys from the blackstuff - The Economist". The Economist. Retrieved 15 November 2014. ^ "Здание луганской СБУ удерживают полторы тысячи вооруженных сепаратистов – журналист : Новости УНИАН". Ukrainian Independent Information Agency. Retrieved 28 April 2014. ^ "There's Violence on the Streets of Ukraine—and in Parliament A news roundup for April 8". The New Republic. 8 April 2014. Retrieved 4 May 2014. ^ Alan Yuhas. "Crisis in east Ukraine: a city-by-city guide to the spreading conflict - theguardian.com". the Guardian. Retrieved 15 November 2014. ^ "Luhansk". Interfax-Ukraine. Retrieved 25 March 2015. ^ "В Луганске выбрали "народного губернатора" - Донбасс - Вести". Вести. Retrieved 15 November 2014. ^ "У Луганську сепаратисти вирішили провести два референдуми - Українська правда". Retrieved 15 November 2014. ^ a b c "TASS: World - Federalization supporters in Luhansk proclaim people's republic". TASS. Retrieved 25 March 2015. ^ "Latest from the Special Monitoring Mission to Ukraine - based on information received up until 28 April 2014, 19:00 (Kyiv time) - OSCE". Retrieved 15 November 2014. ^ "Ukraine crisis: Pro-Russia activists take Luhansk offices". BBC News Europe. 29 April 2014. Retrieved 30 April 2014. ^ "Latest from the Special Monitoring Mission to Ukraine - based on information received up until 29 April 2014, 19:00 (Kyiv time) - OSCE". Retrieved 15 November 2014. ^ "В Луганске сепаратисты взяли штурмом ОГА, правоохранители перешли на сторону митингующих : Новости УНИАН". Ukrainian Independent Information Agency. 29 April 2014. Retrieved 8 July 2014. ^ a b "Красный Луч и Первомайск "слились". Кто дальше? - Новости Луганска и Луганской области - Луганский Радар". Lugradar.net. 30 April 2014. Retrieved 14 May 2014. ^ Автор: Ищук. "Сепаратисты захватили горсовет Первомайска в Луганской области, - СМИ | Новости. Новости дня на сайте Подробности". Podrobnosti.ua. Retrieved 14 May 2014. ^ Jade Walker (30 April 2014). "Ukraine Unrest: Separatists Seize Buildings In Horlivka". Huffington Post. Retrieved 14 May 2014. ^ "Maidan opponents seize Alchevsk city council – media – News – Politics – The Voice of Russia: News, Breaking news, Politics, Economics, Business, Russia, International current events, Expert opinion, podcasts, Video". The Voice of Russia. 13 December 2013. Retrieved 14 May 2014. ^ В Стаханове вооруженные люди ограбили "Бизнес-центр" [In Stakhanov, armed people robbed the "Business Center"] (in Russian). V-variant.lg.ua. 7 May 2014. Archived from the original on 28 July 2014. Retrieved 14 May 2014. ^ Dabagian, Stepan (7 May 2014). 'Никаких националистических идей у нас нет. Мы просто за единую Украину и не хотим в Россию' ['We have no nationalistic ideas. We are simply for a united Ukraine and do not want to become part of Russia'] (in Russian). Fakty.ua. Retrieved 26 May 2017. ^ "Жительница города Ровеньки: "Люди не понимают, что такое "Луганская республика", но референдума хотят" (Люди рассказывают, что не доверяют новой власти, ждут, когда их освободят от "нехороших людей", и хотят остаться в составе Украины)". Gigamir.net. Retrieved 14 May 2014. ^ "Славяносербская милиция перешла на сторону сепаратистов - Новости Луганска и Луганской области - Луганский Радар". Lugradar.net. 5 May 2014. Retrieved 14 May 2014. ^ "МВД Украины заявило о захвате милиции Славяносербска - Газета.Ru | Новости". Gazeta.ru. 17 June 2013. Retrieved 14 May 2014. ^ "Город Антрацит взяли под контроль донские казаки - источник". Retrieved 25 March 2015. ^ "Донские казаки взяли под контроль город Антрацит на Луганщине ›". Mr7.ru. Retrieved 14 May 2014. ^ "Putin's Tourists Enter Ukraine - Dmitry Tymchuk". The Huffington Post. Retrieved 15 November 2014. ^ Shaun Walker. "Ukraine border guards keep guns trained in both directions - The Guardian". the Guardian. Retrieved 15 November 2014. ^ "Северодонецк: сепаратисты захватили здание прокуратуры " ИИИ "Поток" | Главные новости дня". Potok.ua. Retrieved 14 May 2014. ^ "КИУ: Вчера в Старобельске штурмовали райгосадминистрацию". Retrieved 25 March 2015. ^ "Украинские силовики взяли под контроль большую часть Луганской области - источник | Обозреватель". Obozrevatel.com. Retrieved 14 May 2014. ^ "Явка на референдуме в Луганской области превысила 75% :: Политика". Top.rbc.ru. Retrieved 8 July 2014. ^ a b "Ukraine crisis: Will the Donetsk referendum matter?". BBC News. Retrieved 25 March 2015. ^ "Separatists Declare Independence Of Luhansk Region". The Huffington Post. Retrieved 25 March 2015. ^ "Luhansk Regional Council demands Ukraine's immediate federalization". KyivPost. Retrieved 25 March 2015. ^ a b "Luhansk". Interfax-Ukraine. Retrieved 25 March 2015. ^ "Luhansk separatists say their chief wounded in assassination attempt". Kyiv Post. Retrieved 14 May 2014. ^ "Avakov Announces Capture of the 'Commander of the Army of the South-East'". Retrieved 15 November 2014. ^ "Luhansk separatist leader Bolotov free in Ukraine after suspicious 'shootout'". KyivPost. Retrieved 15 November 2014. ^ "Луганская и Донецкая республики объединились в Новороссию". Novorossia. 24 May 2014. ^ "Lugansk People's Republic wants to rewrite its laws according to Russian model". The Voice of Russia. 28 May 2014. Retrieved 29 May 2014. ^ "Ukraine's Lugansk plans to hold parliamentary elections in Sept". GlobalPost. 28 May 2014. Retrieved 29 May 2014. ^ a b Тезисы К Программе Первоочередных Действий Правительства Народной Республики [Theses for Priority Actions Programme for the Government of the People's Republic]. lugansk-online.info (in Russian). Archived from the original on 12 June 2014. ^ a b "Latest from OSCE Special Monitoring Mission (SMM) to Ukraine based on information received as of 18:00 (Kyiv time), 16 September 2014" (Press release). Organization for Security and Co-operation in Europe. 17 September 2014. Retrieved 17 September 2014. ^ "Latest from OSCE Special Monitoring Mission (SMM) to Ukraine based on information received as of 18:00 (Kyiv time), 15 September 2014" (Press release). Organization for Security and Co-operation in Europe. 16 September 2014. Retrieved 17 September 2014. ^ "Latest from OSCE Special Monitoring Mission (SMM) to Ukraine based on information received as of 18:00 (Kyiv time), 18 September 2014" (Press release). Organization for Security and Co-operation in Europe. 18 September 2014. Retrieved 19 September 2014. ^ "Abuse, torture revealed at separatists' prison in Luhansk". Kyiv Post. 3 January 2015. Retrieved 6 January 2015. ^ a b "Package of Measures for the Implementation of the Minsk Agreements" (Press release) (in Russian). Organization for Security and Co-operation in Europe. 12 February 2015. Retrieved 12 February 2015. ^ "Minsk agreement on Ukraine crisis: text in full". The Daily Telegraph. 12 February 2015. Retrieved 12 February 2015. ^ Militia leader not sure if unrecognized Luhansk republic will remain part of "new Ukraine". TASS. 18 February 2015. ^ "Russian-backed 'Novorossiya' breakaway movement collapses". Ukraine Today. 20 May 2015. Retrieved 28 October 2015. Проект "Новороссия" закрыт [Project "New Russia" is closed]. Gazeta.ru. 20 May 2015. Retrieved 28 October 2015. ^ "Местные выборы в ЛНР перенесены на 24 июля". 19 April 2016. Retrieved 30 September 2017. ^ a b "Kremlin 'Following' Situation In Ukraine's Russia-Backed Separatist-Controlled Luhansk". RadioFreeEurope/RadioLiberty. ^ a b "Luhansk coup attempt continues as rival militia occupies separatist region". ^ "Захар Прилепин встретил главу ЛНР в самолете в Москву". ^ "Народный совет ЛНР единогласно проголосовал за отставку Плотницкого" (in Russian). Retrieved 25 November 2017. ^ "Luhansk People's Republic". CONIFA. Retrieved 18 May 2018. ^ "Ukraine's First Separatist Football Derby". Sports. 11 August 2015. Retrieved 8 June 2018. ^ "Кабмин назвал города Донбасса, подконтрольные сепаратистам" (in Russian). Корреспондент. 14 November 2014. Retrieved 26 December 2015. ^ Численность населения по состоянию на 1 октября 2015 года по Луганской Народной Республике [The population as of 1 October 2015 per the Lugansk People's Republic] (PDF) (in Russian). Luhansk People's Republic. 29 October 2015. Archived from the original (PDF) on 4 February 2016. Retrieved 21 December 2015. ^ a b c "Self-proclaimed Lugansk People's Republic elects head, passes constitution". RT.com. 19 May 2014. Retrieved 25 March 2015. ^ hermesauto (11 November 2018). "Ukraine rebels hold elections in defiance of West". The Straits Times. Retrieved 11 November 2018. ^ "Ukraine Rebel Regions Vote in Ballot That West Calls Bogus". Retrieved 11 November 2018. ^ Khalil, Rania. "LPR Election Commission Delivers Accreditations To Int'l Observers Ahead Of Sunday's Vote". Pakistan Point. ^ Yulia Surkova & Daryna Krasnolutska (4 May 2015). "Forget Tanks. Russia's Ruble Is Conquering Eastern Ukraine". Bloomberg. Retrieved 12 January 2016. ^ Ian Bateson (12 November 2014). "Donbas civil society leaders accuse Ukraine of 'declaring war' on own people". Kyiv Post. Retrieved 12 January 2016. ^ "В ЛНР утвердили официальный гимн республики (аудио)". 29 April 2016. ^ "Ukraine crisis: UN sounds alarm on human rights in east". BBC News. 16 May 2014. Retrieved 17 May 2014. ^ a b Report on the human rights situation in Ukraine (PDF). Office of the United Nations High Commissioner for Human Rights. 15 May 2014. ^ "Is the self-proclaimed LPR introduced "criminal liability for homosexuality"?". Retrieved 25 March 2015. ^ "Ukraine Rebels Love Russia, Hate Gays, Threaten Executions". The Daily Beast. Retrieved 25 March 2015. ^ design.lg.ua. "Законы". nslnr.su. Retrieved 10 May 2018. ^ "Lugansk Media Centre — LPR passes law banning gay propaganda to minors". en.lug-info.com. Retrieved 10 May 2018. ^ "Комсомол Луганска – в борьбе за Единую Украину!" [Luhansk Komsomol for united Ukraine]. Ленинский Коммунистический Союз Молодежи Украины. 21 January 2015. Retrieved 22 January 2015. Report on the human rights situation in Ukraine 16 November 2015 to 15 February 2016 (PDF). Office of the United Nations High Commissioner for Human Rights. 3 March 2016. Retrieved 3 March 2016. ^ "Казак Бабай оказался убийцей и насильником, сообщила Генпрокуратура ЛНР". www.mk.ru. Retrieved 23 May 2016. ^ "В ЛНР двойник известного казака-ополченца "Бабая" пытал и жестоко убивал людей". www.rusdialog.ru. Retrieved 7 August 2016. ^ "General Information". Official site of the head of the Lugansk People's Republic. Retrieved 11 March 2018. This page is based on the Wikipedia article Luhansk People's Republic; it is used under the Creative Commons Attribution-ShareAlike 3.0 Unported License (CC-BY-SA). You may redistribute it, verbatim or modified, providing that you comply with the terms of the CC-BY-SA.